This QSGC series UV roller coater (paper coating machine) is used for fabricating pictures for paper and board, especially for thin-paper coating. It a kind of machine with UV oil-passing polishing dual function. This machine is specially equipped with air-knife unit for coating thin paper. This new technology patented for our company, can allow the coating machine operate paper range extended to 80-600g. In addition, the machine use special tuner device and air dropping technology, which is advanced compare with similar products manufactured by other factory in domestic and overseas. Founded in 2009, Shanghai Pripack Machinery Co., Ltd. has continually focused on providing a wide variety of laminating machine, paper coating machine, case maker for customers around the world. 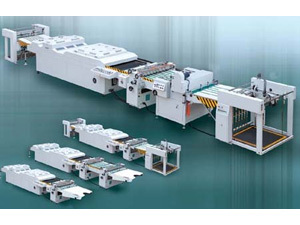 We are very familiar with international market of igid box maker (rigid box production line), paper cutter, flexographic printer, flexo die cutter and its trend of development. With high quality assurance, our products are popular in markets including Ukraine, Russia period, Chile, Brazil, Argentina, Mexico, Malawi, Pakistan, South Africa, to name a few. With products of high quality assurance and CE certificated, we are sure to provide our customers with the best products at competitive price.